It is an exciting new investment technology. More seasoned citizens tend to be skeptical of newer investments which leaves the door open for millennials. I want to tell you about three great ways I use Bitcoin to grow my wealth. Bitcoin is a decentralized digital currency. It’s decentralized. Bitcoin isn’t controlled by one person or a single entity. Contrast that with dollars which are controlled by the Federal Reserve bank. It’s digital. You can send and receive bitcoins across the globe via the internet. It’s a currency. It’s kind of like dollars. You can use it to buy stuff! There are three methods I utilize to profit from Bitcoin: Owning, Arbitrage, and finally Margin Funding. Unlike dollars and other fiat currencies that constantly go down in value due to inflation (central banks creating more units of the currency), Bitcoin is deflationary. What this means is that the number of Bitcoins that will ever be in existence is fixed, as a result there is upward pressure on the value of Bitcoins. So, as more people are interested in using the currency, the value will tend to rise over time. Buying directly and hoping it goes up in value is one speculative option. Given the tremendous volatility, or price fluctuations of Bitcoin, this is the most risky. For example, if you bought some in late 2013 for $1,100 and sold in 2015 for $200 you’d have lost about 80%, ouch. But on the flip side if you bought back in 2015 for $200 and sold it today for $670, that’s a cool 235% return. Understanding how volatile Bitcoin is and dollar cost averaging is the name of the game. I do hold some Bitcoins that I buy through CoinBase (get $10 free bitcoin when you buy $100 of coin using that link). But there are a variety of exchanges on which you can purchase Bitcoin. 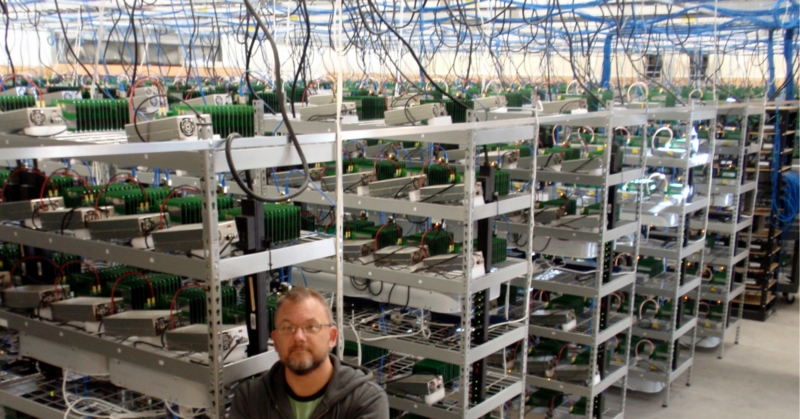 Some random guy and what is apparently the largest Bitcoin mine in existence? There are a number of exchanges where you can buy and sell Bitcoin. The prices vary on different exchanges and by simultaneously buying and selling on different exchanges one can take advantage of the price difference. For example, if on exchange A Bitcoin is selling for $600 and on exchange B Bitcoin is selling for $605, you can buy Bitcoin on exchange A for $600, and then sell it on exchange B for $605 to pocket a $5 profit. While you could do this manually the price differences tend to be small and so you really need to do this thousands of times per day to make any real profits. I don’t have the time or patience to do that so I use an automated service. One exchange called BitBays has an Arbitrage Fund that pays 12.95% per year and because it is denominated in USD you eliminate price fluctuation risk (and potential for reward). You also expose yourself to USD devaluation risk. You could opt for the Arbitrage fund which pays 10.95% if you want to speculate on the upside potential of this currency and take advantage of the arbitrage rate of return. This is one of my favorites. Some people like to trade on margin. Essentially they borrow money to buy or sell Bitcoins. It’s very risky to trade on margin and margin trading isn’t something I do. But these margin traders need to borrow the Bitcoins from someone. So by lending to margin traders, you can earn a solid rate of return with little risk. The return fluctuates based on how much traders are willing to pay to borrow money but I’m on track to earn 20% this year. Bitfinex is an online exchange that allows lenders to make money by loaning the currency to margin traders. I discuss this more in an article called Margin Funding to Generate Passive Income. You can choose to loan margin funding in either USD (which pays more interest) or Bitcoin (which pays less interest and has the risk and reward of Bitcoin going up or down). Hopefully you understand this currency a little better and have some new ideas for how to profit from this emerging technology. While it has been around since 2008 it is still relatively new and so you can be among the early adopters. Some people say it is too risky but the three investments above have work for me. With stocks at all-time highs and savings accounts paying nothing these are three alternatives to traditional investments. Unlike mutual funds and bank accounts these aren’t your parents’ investments. If you have any questions about these investments I’ll be monitoring the comments section to reply. Would you ever consider Bitcoin investing? Hi John, thanks for the interesting post! I recently listened to a Planet Money podcast on bitcoins as well as having read a few detailed research reports. Sounds like a checkered past to say the least. The block chain technology behind it seems promising, which is why many large banks like JP Morgan and others have been investing in their own use of it. While a principle of mine has always been not to invest in what I don’t know (popular Warren B advice), and even considering the research I have done, I’ve elected to stay on the bitcoin sideline. Bitcoin has had some growing pains and it could be just another fad, but I think it’s more likely that it will be a valuable technology in the future. I don’t blame you for staying on the sidelines! I’ve started to learn more about Bitcoin and this post certainly helps. I hadn’t heard of margin funding for Bitcoin, which is an interesting idea. Definitely something I will look more into. Thanks for the info! I hadn’t heard of it either! I’m with Green Swan on this. Avoid investing in things you don’t know. Interesting though. Another investment option for some. I think I’ll avoid it as well, but it is really interesting. Before John sent me this post I hadn’t even considered Bitcoin as a serious option. This WAS a really interesting article! Thank you! After reading it, I immediately tries looking up how to start investing on Bitcoin, but when I was on the website I had NO idea where to begin. Could you either explain a step by step way of how to start on Bitcoin or direct me to some reputable articles? Thanks so much! @M$M, absolutely LOVE the website! I just found it last night and spent about 3 hours reading through different posts. It’s already been a major help being I’m $20,000 in personal debt and $60,000 in school loan debt. Thanks again! My favorite articles are about investments, especially investments that don’t require a minimum. I’ve been wanting to get into investing for a while, but I’ve never made $30,000 or more in my entire adult life. I make maybe $1,000 to $1,200 month with my monthly bills (credit cards, car payment, phone, etc.) Are $1,000. If there are more non minimum investment options, non minimum CD’s or other ideas, I would love to learn about them. Thanks! Thanks Christa, I’ll keep that in mind when I’m scheduling posts for the rest of the year! If you just want to buy some bitcoins you can follow this process: https://www.coinbase.com/buy-bitcoin?locale=en but there are a variety of places you can buy bitcoins. I’ve used coinbase but there are lots of other places too. Unlike currencies or even precious metals, BitCoin is not backed up by anything at all… Your virtual deposits aren’t insured, either. Do you recall the BitCoin hack 2 years ago? (In Japan, I believe.) Or the one that just happened in Hong Kong? There is no regulation, no insurance, no guarantees – the system would only work if everyone were perfectly honest and the servers were bulletproof, but neither will ever be true. I agree – I’m not going to go out and buy bitcoins, but it’s an interesting story/strategy nonetheless. I doubt my readers are running out right now buying all the Bitcoins they can handle. It’s actually ok to look at something sometimes and go…”huh, that’s different”. Also – check out a book called “The Creature from Jeckyll Island” if you haven’t. You might like it! I haven’t heard of this book, but I’m familiar with the subject matter… At the risk of sounding like an ostrich, I find it best to let dragons fight one another and concentrate on the things within my purview. I appreciate your sentiment. I certainly don’t recommend Bitcoin to anyone. I just talk about things I’m doing. You’re absolutely right about the risk of hacks. As luck would have it, Bitfinex was hacked back on August 2nd and account holders (myself included) have suffered a 36% haircut. Ouch. These are very strong statements. I think there a fallacy that regulation makes things safer, which isn’t necessarily true. There was a tremendous amount of regulation and insurance in the housing industry and 2008 did not turn out very well for many. The (Bitcoin) system certainly doesn’t rely on everyone to be perfectly honest, that is simply not true. I’d also point out that fiat currencies and gold are not backed by anything either. Gold has non-monetary use, which make it attractive, but Dollars, Euros and all other fiat currencies are not backed up since virtually all countries went off the gold standard.